Biggest jump in unemployment rate since 1986 - combined with energy and housing woes - stokes fears about recession. NEW YORK (CNNMoney.com) -- A spike in the unemployment rate - the biggest in more than two decades - raised new concerns Friday that a weak labor outlook, high oil prices and continuing woes in the housing and credit markets are leading the U.S. economy into a painful recession. The government said Friday that the unemployment rate soared to 5.5% in May from 5% in April - much higher than economists had forecast. The surge marked the biggest one-month jump in unemployment since February 1986, and the 5.5% rate is the highest level seen since October 2004. 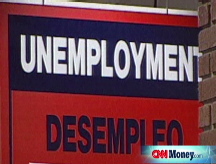 Unemployment is now a full percentage point higher than it was a year ago. "You're not going to have a lot of people arguing 'no recession' with this data," said Lakshman Achuthan, managing director of the Economic Cycle Research Institute. The prolonged job loss and jump in unemployment are better indicators that the economy is in a downturn than is the traditional thumbnail rule of two quarters of falling gross domestic product, he said. The jobs report came on the same day that oil prices soared to $134 as the dollar lost value against the euro and the yen. It also comes the day after the Mortgage Bankers Association reported that homes in foreclosure crossed the 1 million mark during the first quarter, a record high. "All these things take time to digest," said Roger Bayston, a senior portfolio manager for Franklin Templeton Investments. "We believe that in the long-term the economic boat is going to righted, but in the near term everyone is going to be busy bailing water." John Silvia, chief economist with Wachovia, said the unemployment rate was distorted by a big jump in teenage unemployment in May, to 18.7% from 15.4%, as the school year ended and teenagers started searching for jobs. And the Labor Department figures were probably underestimating unemployment in the months leading up to Friday's report, he said. "This report reflects what we should have seen over the last two to three months," said Silvia. The Labor Department also reported Friday a net loss of 49,000 jobs in May, compared to a revised loss of 28,000 jobs in April. That was a touch better than economists' forecast of a 60,000 loss, but it marked the fifth straight month that the economy has lost jobs. Overall, the economy has shed 324,000 jobs this year, the worst start to a year since 2002, when the nation was still struggling with the aftereffects of a recession. The job losses in the payroll report were widespread, as the battered construction industry lost 34,000 jobs and manufacturers cut 26,000 jobs from the nation's factories. But the service sector also saw job losses in many sectors, as retailers trimmed 27,000 jobs. The business and professional services categories took a 39,000 job hit. "The business and professional has to be a focus of concern. The job losses have broadened out," Silvia said. "Those are generally good-paying jobs. This is a clear sign the weakness is spreading beyond the construction and manufacturing." Part of the decline in business and professional services came from a 30,000 cut in temporary jobs, bringing losses in that sector to 106,000 so far this year. Tig Gilliam, chief executive of Adecco Group North America, the unit of the world's largest employment firm, said that cut is another indicator about widespread concern among employers. "As the economy slows down, the temporary employees are sometimes the first to go," he said. Temporary employment also tends to pick up just before a recovery, he said. "The May number shows there's no recovery (ahead) yet." Presidential candidates Barack Obama and John McCain were both quick to react to the jobs report. Each argued that the dire employment picture was proof that they had the best solution for the nation's economy, and that their opponent's policy would be a mistake. "This is a reminder that working families continue to bear the brunt of the failed Bush economic policies that John McCain wants to continue for another four years," said Obama's statement. "We can't afford John McCain's plan to spend billions of dollars on tax breaks for big corporations and wealthy CEOs." McCain's statement argued that tax breaks are more important to spur the economy in the face of weak employment. "The wrong change for our country would be an economic agenda based upon the policies of the past that advocate higher taxes, bigger government, government-run health care and greater isolationism," said McCain's statement. "To help families at this critical time, we cannot afford to go backward as Senator Obama advocates." iReport: What's the job market like for you?